Entering the Pisgah National Forest we journeyed over the creek and into the woods to discover the blooming crowns of jewelweed. It made me wonder if jewel-weed isn’t some king of oxymoron like cruel-kindness or definitely-maybe. But there is no maybe about it – she is definitely a jewel of a weed. 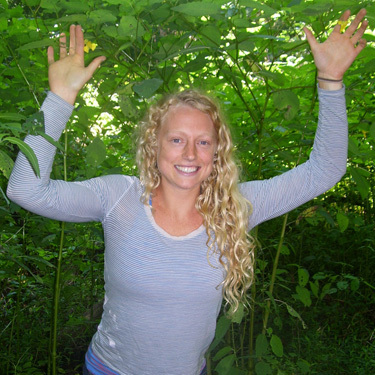 The intention for this summer day was for my apprentice, Jamie, and I to harvest the aerial parts of jewelweed in all of its abundance and learn more about her medicine. Ice cube trays full of fresh juice from the stem and leaves would be frozen, popped into baggies and stored in the freezer awaiting the aftermath of someone’s unfortunate encounter with poison ivy, oak or sumac. Even an insect bite or a reactive sting from our dear friend stinging nettle can be soothed by the astringent and anti-inflammatory combination of jewelweed along with the numbing effect of ice. Equipped with a large plastic bag we gathered about ten jewelweed plants, just enough for juicing through a Champion juicer. You can also chop then succus the aerial parts of jewelweed in a blender or food processor with just enough water to cover in order to release the gel-like soothing mucilage. While out in the woods you can simply rub the fresh plant between the palms of your hands for immediate use as a poultice and to prevent a reaction to poison ivy. 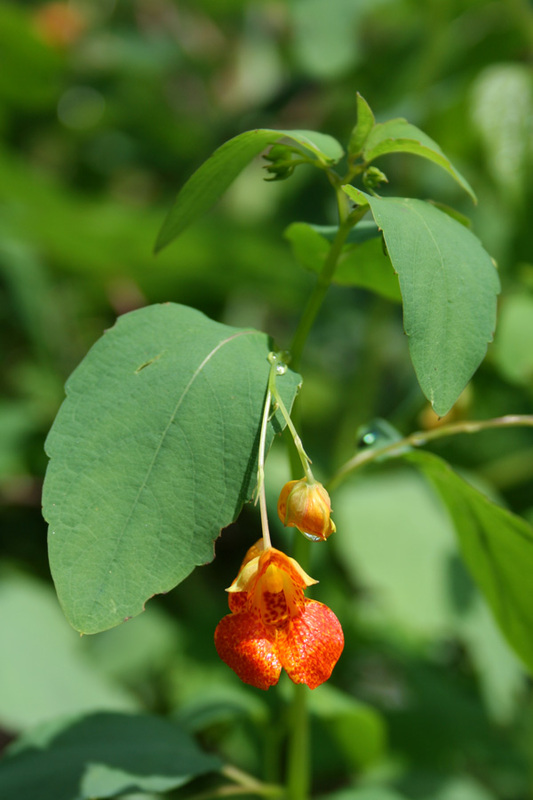 It is believed that jewelweed is more effective at washing the oil away that causes a rash from poison ivy than soap. Typically jewelweed and poison ivy can be found in the same area making it a very convenient antidote. Jewelweed, Impatiens capensis is in the Balsaminaceae, “Touch-Me-Not” family. It is a two to five foot tall annual plant that often forms large colonies in moist or wet habitats. Growing in colonies as it does makes it possible to harvest many plants with very little effort by pulling them up in bunches and trimming off the roots. Once harvested jewelweed wilts quickly. Its alternate and ovate shaped leaves are one to four inches long and are water-repellent. The entire plant is smooth and translucent and after a rain become covered with beads of water that reflect the light presenting a jewel-like appearance and giving it the common name, jewelweed. Jewelweed flowers are orange or yellow and hang like pendants from a thread-like stalk. They are irregular, with five petals: the upper two are united; the lower three separate with reddish brown spots. I. capensis has orange flowers while I. pallida has yellow flowers. Both species have the same medicinal properties. Jewelweed blooms from July to September and is best harvested during June or July. In late fall the ripe seedpods can be eaten and taste similar to walnuts. It’s common name, “touch-me-not: describes how the ripe seed pods explode when touched, flinging seeds far from the plant. Not satisfied with just one hike into the woods to admire the jewel like faces of her flowers a few short weeks later we found ourselves hiking out again. 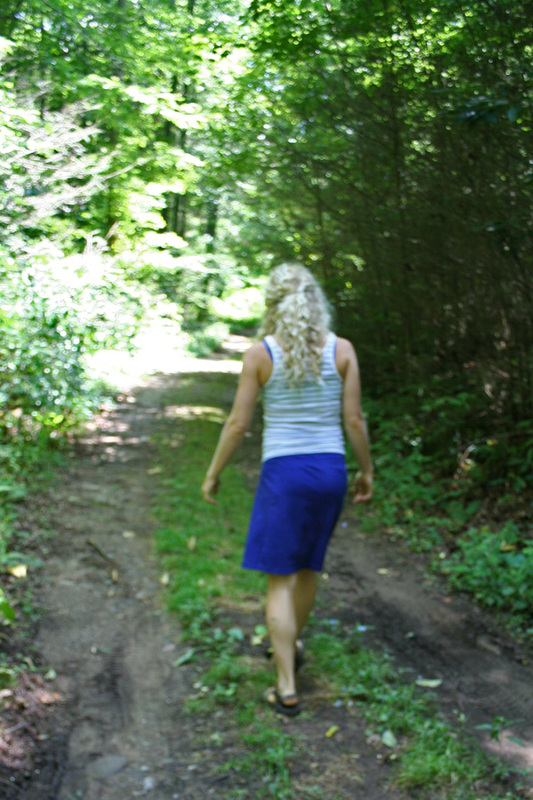 This time it was along the Oconaluftee River in the Cherokee National Forest down a path lined with Cherokee medicinal plants. It was here that we found the largest patch of jewelweed we had ever seen. It was literally over our heads. The Cherokee used jewelweed juice for all of the same purposes mentioned above. According to folklore jewelweed is always found growing near poison ivy, and we found this to be true on both of our hikes into the forest. Poison ivy is actually an imposter and not a true ivy (Hedera). 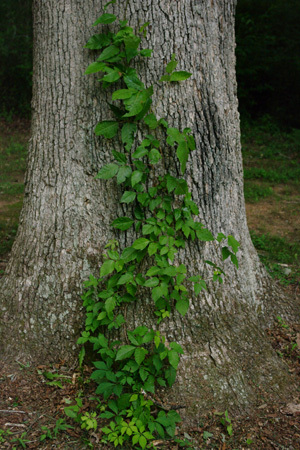 A trailing or climbing vine it is most commonly found along tree line breaks at the edge of the forest and is only somewhat shade tolerant. Development of real estate adjacent to undeveloped land has engendered its formation. Poison ivy, Toxicodendron radicans, has doubled since the 1960’s and will double again as a result of the increase of carbon dioxide in the atmosphere. These elevated levels of carbon dioxide from global warming are creating bigger, stronger poison ivy plants that produce more urushiol, the oil that causes a poison ivy rash. 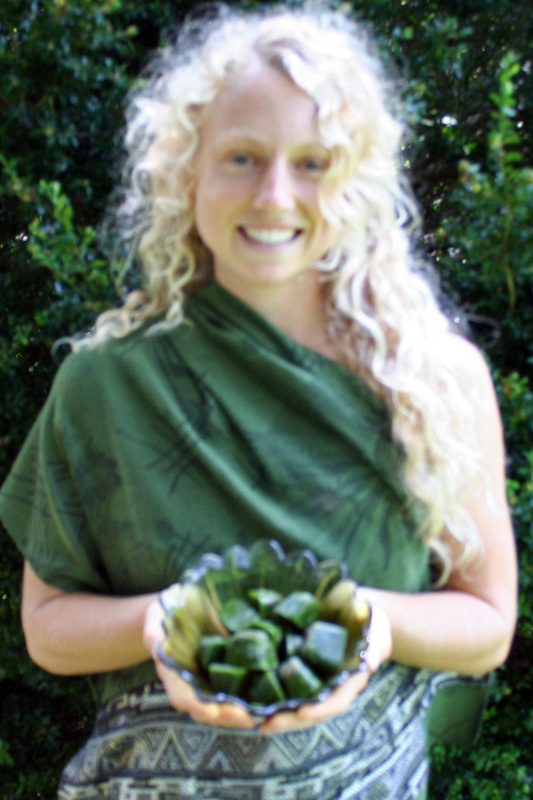 The urushiol isn’t just more plentiful it also more potent. A super good reason to keep some jewelweed ice cubes in your freezer. 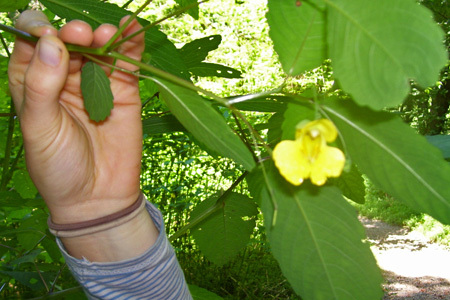 Both poison ivy and jewelweed are considered invasive but are not as damaging as invasive exotics. These native plants tend to take over an area but they don’t do as much damage because they evolved with native insects and other plants. 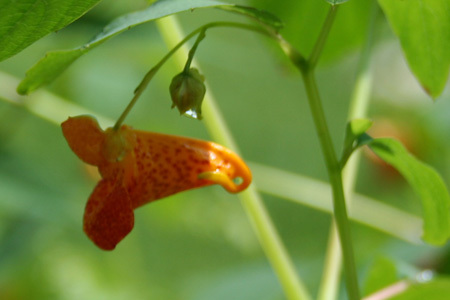 Jewelweed’s ability to aggressively reseed enables it to out-compete other native vegetation. We saw evidence of this on the Cherokee trail when we discovered a literal forest of jewelweed. Its replacement of perennial vegetation on riverbanks may lead to increased soil erosion because of its delicate roots. It also produces alluring nectar, which may potentially attract pollinators away from other native plants reducing their seed set. In Timothy Lee Scott’s controversial book, Invasive Plant Medicine: The Ecological Benefits and Healing Abilities of Invasives, he asks, “So what happens if we were to shift our point of view and see an invasive plant (weed) as useful?” He points out the waste of energy and the millions of dollars spent enlisting various invasive plant coalitions, universities, environmental conservation groups, state and federal agencies, along with the herbicide industry, in an attempt to eradicate invasive plants. The use of machinery and millions of gallons of herbicides polluting both soil and water throughout the world is costing us billions. Clinical herbalist, Michael Tierra argues on the topic of whether or not to control invasive plants depends on the invasive. Perhaps poison ivy is phytoremediating carbon dioxide and we would do better to look at how we have contributed to the invasion through the destruction and disturbance of habitat. If poison ivy is the enemy than jewelweed is a fortunate antidote. If we remain open to the intelligence of plants we will see that there is an interrelationship between invasives and the broader web of life. I, personally, even after a lifetime of camping, hiking and hanging out in the woods and many direct encounters with poison ivy have been fortunate to never experience a rash. As an herbalist, however, I feel a responsibility to keep as many medicines as I can on hand, like jewelweed ice cubes in my freezer. While out weeding my garden this week I pondered the dilemma of weeds and invasives. Certainly we have always been in partnership with nature, creating beautiful spaces by removing what doesn’t serve the garden landscape and leaving other areas to nature’s hand. It is a partnership gone awry as we disconnect from nature, but the evidence is mostly anecdotal so I offer you my testimony in favor of nature’s hand. Being the eternal optimist I am hopeful that we will continue to find the value in weeds, leave well enough alone where we may, and have the wisdom to know the difference. 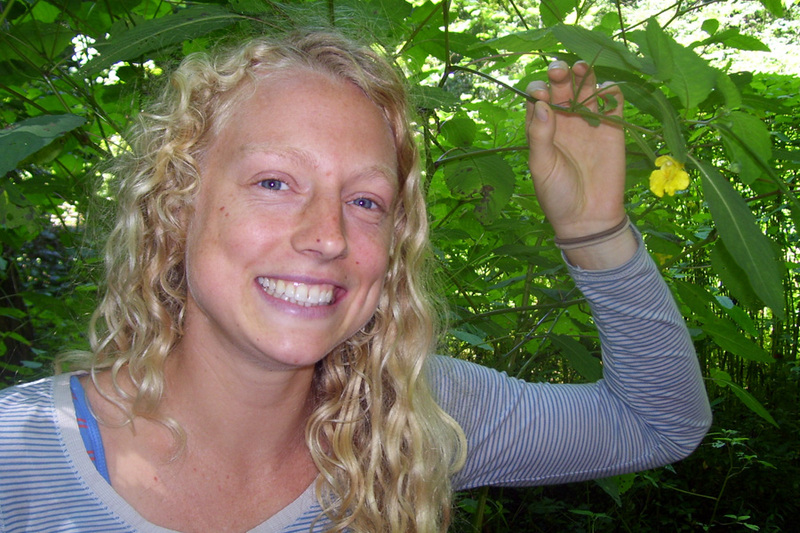 Invasive Plant Medicine: The Ecological Benefits and Healing Abilities of Invasives, by Timothy Lee Scott. Study with Thea Summer Deer at Wise Woman University ~ reweaving the healing cloak of the ancients. Thank you so much for your informative articles. I was recently in the Blowing Rock, Boone and Valle Crucis areas and noticed the abundance of Jewelweed this year. I got to harvest some and have tinctures going along with drying it for use in salves. I appreciate your thoughtful post on this controversial topic. I too am trying balance Timothy Lee Scott’s book on Invasive Plant Medicine with many American Government supported attempts to eradicate invasives to maintain the presence of both cultivars and natives. What I see that causes me the most concern is the use of toxins to control these invasives, which as Sue Reed says so nicely takes the “present-day ecosystems, which are experiencing profound stresses, from climate change to acid rain to habitat fragmentation, on orders of magnitude unknown thousands of years ago.” and making this situation worse. Tamarind: A Functional Food for Improving Digestion, Reducing Cholesterol and Lowering Blood Pressure.